Sheriff Bowling says that the costs of running the jail have “grown exponentially,” while the department is down $60,000 due to the shutdown. For the first item on the agenda, on January 15th, 2019, the Creek County Commissioners approved a 2019 INCOG REAP Contract with INCOG on behalf of the Olive Volunteer Fire Department for the purchase of Rescue Extrication Tools for $10,000 and authorization for the Chairman to execute. Jason Dobson, a representative of the Olive VFD, was present and told the assembly that he was grateful for the grant and excited to be able to buy more equipment. They opened bids for 4 ten-ton gas package units (HVAC) for the fairgrounds. There were six bids: DAVCO for $32, 720.00; Cartwright Supply Heating and Air for $34, 285.00; Hoover and Hoover Construction for $22,000.00; AirCo Service of Tulsa for $34,739.00; Quality Heating & Cooling for $43,206.00; Morrison Supply Company of Broken Arrow for $28, 442.00. The commissioners stated they need time to peruse the data and and make a decision which bid to accept. They needed to arrange a special meeting to review the information with the Fair Board. It was passed to January 28th. A request for surplussing and junking some equipment that was already junked was listed to get the paperwork caught up with the facts. It included a laser printer, a couple of hutches and a shelf cart, a label printer, and a Dell computer. There was also a KIP 3000 Wide Format Plotter to let for bid. Then they went into Executive Session for 24 minutes to discuss secure access technology, then came out and approved Castle Com to service the Courthouse Complex in the amount of $33,120.20 out of the GA2 account. In the January 22nd meeting, the Creek County Commissioners approved the Allocation of Alcoholic Beverage Tax for the county’s towns: Sapulpa, $18,124.60; Shamrock, $90.46; Bristow, $3,718.63; Kellyville, $1,014.46; Kiefer,$1,486.15; Mounds, $1,030.61, among others. The Total for the month was $32,307.67. The Commission passed until Feb. 11th the Sales Tax Agreement between the Board and the Public Facilities Authority, for transferring sales tax funds to the Authority with the sales tax resolutions and requirements of the State Auditor’s Office. It is an ongoing negotiation. The Sheriff of Creek County, Bret Bowling ,explained that the costs of running the jail have “grown exponentially.” The department is down “$60,000 with the shutdown.” He also said the staffing level was “horrible at best,” and the jail was the “highest liability in the county” (potential for lawsuits at the jail). And he wanted to be a good steward of the public money. The Board approved an agreement between the Oklahoma Turnpike Authority District for repair of portions of the roads that have been damaged by the highway construction. About 1.4 miles has to be repaved and the cost might run about $100,000 to $130,000. Creek County’s share for repairs would be $49,000. These damages are going to be made, remarked Commissioner Warner. The Treasurer Don Engle requested that the bid for the title work mentioned in previous meetings, for all the properties that are in arrears in taxes for 4 or more years, should go to Creek County Abstract Co. at $62.00 per parcel as opposed to American Abstract & Title that bid $95.00 per parcel. This was approved by the commission. 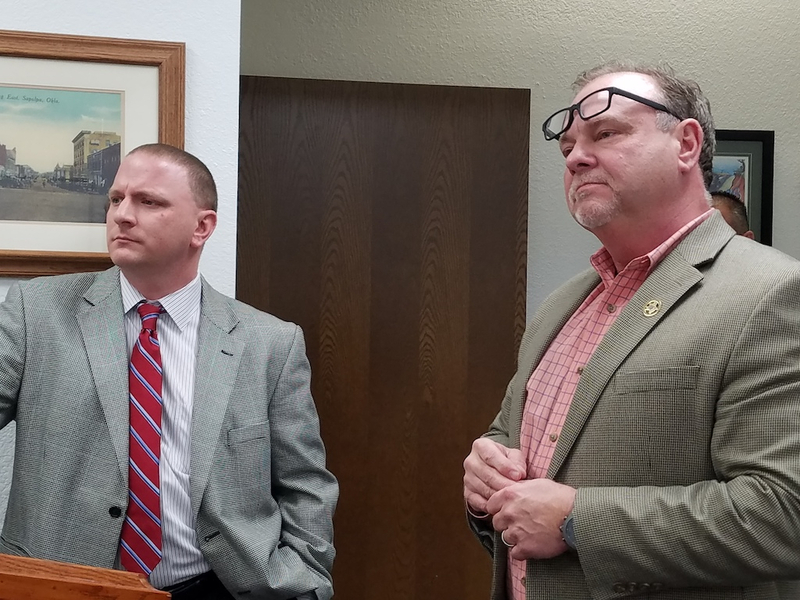 The election of Judge Kelly Hake allowed for the change in Requisitioning Officer for Creek County District Attorney Office from retired Judge Joe Sam Vassar to the newly elected judge, which the commissioners approved. The next meeting will take place in the Collins Building on Monday morning at 9 a.m. The public is always invited to attend these meetings, to get acquainted with your elected county officials, and find out how the public funds are spent. There is an opportunity at every meeting to address the commissioners directly.